The World or The World Islands, (Arabic: جزر العالم; Juzur al-Ālam) is an artificial archipelago of various small islands constructed in the rough shape of a world map, located in the waters of the Persian Gulf, 4.0 kilometres (2.5 mi) off the coast of Dubai, United Arab Emirates. The World islands are composed mainly of sand dredged from Dubai's shallow coastal waters, and are one of several artificial island developments in Dubai. The World's developer is Nakheel Properties, and the project was originally conceived by Sheikh Mohammed bin Rashid Al Maktoum, the ruler of Dubai. The actual construction was done by two Dutch (joint venture) specialist companies, Van Oord and Boskalis. The same companies also created the Palm Jumeirah. Construction of the 300 islands began in 2003, only to halt due to the 2008 financial crisis. Though 60 percent of the islands had been sold off to private contractors back in 2008, development on most of these islands has failed to initiate. As of July 2012, the Lebanon Island was developed and was the only island that had so far been developed commercially, being used for private corporate events and public parties. As of late 2013, only two of the islands had been developed. In January 2014, Kleindienst Group announced the launch of "The Heart of Europe" project; by February 2014, one of Kleindienst Group's brands - JK Properties - announced in their monthly newsletter that the project was "well underway". The first of these series of islands will be Europe, Sweden and Germany with development led by Kleindienst Group. Islands in the project range from 14,000 to 42,000 square metres (150,000 to 450,000 sq ft) in area. Distances between islands average 100 metres (330 ft); they are constructed from 321,000,000 cubic metres (1.13×1010 cu ft) of sand and 386 million tons of rock. Designed by Creative Kingdom Dubai, the development is an area that covers 6 by 9 kilometres (3.7 by 5.6 mi) and is surrounded by an oval-shaped breakwater island. Roughly 232 km (144 mi) of shoreline was created. The World's overall development costs were estimated at $13 billion CAD in 2005. The archipelago consists of seven sets of islands, representing the continents of Europe, Africa, Asia, North America, South America, Antarctica, and Oceania. Each artificial islands is named for its representative regions, including those representing countries, landmarks, and regions such as the United Kingdom, California, Mount Everest, Australia, New Mexico, Upernavik, Buenos Aires, New York, Mexico, St. Petersburg and India. The Times Online reported in September 2009 that work on The World had been suspended due to the effects of the global financial crisis. And in February 2010 the Daily Mail reported that the islands had started sinking back into the sea. This was later denied by Nakheel and independent technical reports as wholly inaccurate. Despite the denial, The Daily Telegraph reported in January 2011 that an independent company, Penguin Marine, provided verification on the erosion of the islands and the silting of the passageways between the islands. Due to finance and technical problems, Penguin Marine, the company contracted to provide transportation to the archipelago, is attempting to get out of the annual fees of $1.6 million paid to Nakheel properties. Irish investor/businessman John O'Dolan, who purchased the "Ireland" island, committed suicide in February 2009, after his consortium fell into financial difficulty. The World was supposed to be serviced by four major transportation hubs linked by waterways. Land parcels are supposedly zoned for various uses: estate, mid density, high density, resorts and commercial. A Dubai Infinity Holdings construction planner has stated that developers have been negotiating with Nakheel about temporary siting of a cement batching plant on one of the islands to supply subdivided construction. The plan was for utilities to be routed under water, with water plants at each of the hubs pumping fresh water to the islands. Power was to be supplied by the Dubai Grid and distributed through underwater cables, however as of February 2015 no cables had been laid, so that developers currently have to provide their own power from diesel generators. Wastewater and refuse systems are an individual concern for each island. Nakheel Group is itself further developing a resort named Coral Island over 20 islands that make up the North American part of The World. The low-rise development will include a marina and hotel village. The second largest confirmed development is the purchase of 14 islands that make up Australia and New Zealand by Investment Dar of Kuwait. The islands are being terraformed to be developed as a resort named OQYANA. Irish business consortium Larionovo had plans to develop the Ireland island into an Irish-themed resort. The plans include a large internal marina, apartments and villas, a gym, hotel, and an Irish-themed pub. In July 2007 it was announced that the Ireland Island would feature a recreation of Northern Ireland's Giant's Causeway. However, on 25 November 2008, a provisional liquidator was appointed to Larionovo. The islands of Great Britain and Moscow on The World were acquired by Premier Real Estate Bureau in the Summer of 2008. News was leaked in a Daily Mail article of January 2009, refuting claims that Great Britain was owned by Richard Branson, Rod Stewart or John O'Dolan. In April 2008, Salya Corporation announced that it had acquired the islands of Finland and Brunei in The World and planned to develop them into fashion-themed resorts. Salya spent about Dh800 million ($218 million USD) to purchase the islands and plans to spend a further Dh2.4 billion ($654 million USD) on development. Brunei Island will be turned into a Fashion TV resort and Finland Island will be turned into a fashion community called FTV palace. Safi Qurashi, the seven-time multi-millionaire entrepreneur  at the head of Premier, and his business partner Mustafa Nagri, paid an estimated $64 million USD for the 4.5-hectare (11-acre) piece of land; he was later convicted for non-payment of cheques and sentenced to seven years in jail. However, on appeal he was later found not guilty and released from prison in July 2012 when he was declared innocent of two of the three charges. and  On the final charges the civil court final judgment showed he owed no money, was a victim of fraud and vindicated him completely by awarding 10.8 Million USD to be paid back to him by his former partner who had defrauded him. and  Safi Qurashi is still the owner of GB Island and continues to live and run his businesses in Dubai and is still confident of developing the Island of GB into a unique destination. Josef Kleindienst and his firm JK Properties are developing The Heart of Europe, a collection of seven islands (Germany, Netherlands, Sweden, St. Petersburg, Main Europe, Switzerland and Monaco) in the European section of the World, into an island luxury resort. The resort is meant to create a fully immersive European experience, with outdoor snow, and stores accepting only the EURO as a currency. May 2003: The World development was announced by Nakheel, total completion scheduled for 2008. It was initially to have 200 islands and an area of 5,600,000 square metres (60,000,000 sq ft). February 2004: It was announced that The World would comprise 260 islands, and its area would be 6 km by 9 km, with an area of 23–83,613 square metres (250–900,000 sq ft) for each island, with 50–100 m (160–330 ft) of water between each island. August 2004: It was announced that land reclamation would cost at AED 7.3 billion ($2 billion). April 2005: Sand dredging 55 percent complete, 88 islands had been completed. 30 March 2006: Richard Branson appeared at a media conference on the Great Britain island. However, this was to announce direct London-to-Dubai flights by Virgin Atlantic, and was not related to his investing in the project. October 2006: Seven-time Formula One World Champion Michael Schumacher was presented with one of the islands by Mohammed bin Rashid Al Maktoum on the occasion of his final Grand Prix, in Brazil. Schumacher's manager Willi Weber, suggested, "Perhaps he'll build a kart racing track on [the island]. December 2006: The World reclamation 90 percent complete. October 2007: Nakheel announced the sale of Ireland, and Shanghai in October 2007. 15 November 2007: Brad Pitt and Angelina Jolie were reported to have purchased the island Ethiopia[according to whom?]. The claim has since been refuted. January 2008: The World breakwater is completed. 19 February 2008: Cinnovation Group acquired a 37,000-square-metre (400,000 sq ft) island as part of a project valued at $200 million USD. Guest and residential villas and a hospitality complex are planned. 25 February 2008: Dubai Multi Commodities Centre announced that it will establish a 6,000-square-metre (65,000 sq ft) pearling and marine entertainment center in association with Paspaley Pearling Corporation. It will be located on an island in the Antarctic region of The World. September 2008: Dubai's Limitless announced plans to develop a $161 million USD wellness resort on an island in "Siberia". Pearl Dubai paid $27.2 million USD for a 150,000-square-metre (1,600,000 sq ft) island nearby. 28 December 2008: Turkey Island was bought by MNG Holding in June 2008 for $19 million USD. 28 December 2008: China's Zhongzhou International announced that it will be developing a hotel resort on Shanghai island. 28 December 2008: Nakheel said 70 percent of The World had been sold. October 2009: An Emirates Business report on 13 October 2009 that 2 islands were sold in July and August 2009. December 2009: Dubai based Kleindienst Group said they would start construction of the Heart of Europe in early 2010, according to a press report of 17 December 2009. Islands include Austria, Germany, Netherlands, St Petersburg, Sweden and Switzerland. January 2010: On 28 January 2010 Emirates Business reported that Major Trade had started development of their projects on an island in the Greenland area, a villa and hotel resort. 23 February 2010: Dubai-based Kleindienst Group started work on the Germany island of The World, according to a press release on 24 February 2010. 17 July 2012: The Royal Island Beach Club opened on Lebanon Island. 6 May 2013: Nakheel announces that an out of court settlement has been reached between itself and developer Kleindienst Group, allowing construction on "The Heart of Europe" to resume. 10 June 2013: Construction began on the island Taiwan. 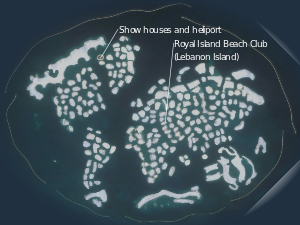 2 July 2013: Nakheel announces that settlements "with São Paulo Development Ltd for São Paulo Island and a GCC investor for the purchase of Nord Island", totaling "AED185 million", along with the earlier out of court settlement with Kleindienst Group (valued at AED622 million) have "put The World back on the map". 10 December 2013: Nakheel announced plans to connect the islands with a road. January 2014: Kleindienst Group's JK Properties announces that "[w]ork has commenced on The Heart of Europe". January 2014: Website "The Heart of Europe" publishes monthly construction updates for the project. February 2014: JK Properties announces that the "Heart of Europe" islands construction is "well underway". 7 December 2016: The Heart of Europe project makes major progress when the Dubai-based company JK Bauen, part of the Kleindienst Group, appointed Chinese-based companies Wuchang Ship Building Industry Group and Sino Great Wall International Engineering in a joint venture to develop facilities on the six islands. Wikimedia Commons has media related to The World. ^ a b c d e "Dubai's Palm and World Islands - progress update". AMEInfo. 2007-10-04. Archived from the original on 2007-10-11. Retrieved 2008-02-02. ^ a b "'The World' is sinking". The Age. 28 January 2011. Retrieved 28 January 2011. ^ Schaffer, Sierra (23 May 2016). "The "World" Is Sinking Back Into The Sea, Dubai's World Islands That Is – TechMalak". TechMalak. ^ "KLEINDIENST GROUP LAUNCHES ICONIC THE HEART OF EUROPE PROJECT". JK Properties. January 2014. Retrieved 14 March 2014. ^ "WORK CONTINUES TO PROGRESS AT A PACE ON THE HEART OF EUROPE". JK Properties. February 2014. Retrieved 14 March 2014. ^ "The World Islands". Atlas Obscura. September 26, 2016. Retrieved July 8, 2018. ^ a b c d "The World islands in Dubai complete". ArabianBusiness.com. 2008-01-10. Retrieved 2008-02-02. ^ Colin Simpson. "The World is back on Dubai's map". Retrieved 18 April 2016. ^ McLean, James (September 12, 2009). "Credit crunch signals end of The World for Dubai's multi-billion dollar property deal". London: Times Online UK. Retrieved 2009-11-28. ^ Johann Hari (2009-04-07). "The dark side of Dubai". London: The Independent. Retrieved 2009-05-16. ^ Shane McGinley (2010-02-04). "Island owners hit back at 'sinking' claims". arabianbusiness. Retrieved 2010-02-04. ^ a b Spencer, Richard (2011-01-20). "The World is sinking: Dubai islands 'falling into the sea'". London: The Daily Telegraph. Retrieved 2011-01-25. ^ "The End of The World". Kompas.com. Retrieved 6 January 2012. ^ "JK Properties Monthly Newsletter (Nov. 2013) "A BRIGHT OUTLOOK FOR DUBAI'S PROPERTY MARKET"". JK Properties. November 2013. Retrieved 14 March 2014. ^ a b Nakheel. "The World Video Gallery". ^ The National Newspaper. "'The World' three-quarters sold out". ^ "Nakheel unveils super-luxury resort at Coral Island of The World". National Media Council UAE. 2007-03-05. Retrieved 2008-03-26. ^ "Nakheel sells Australasia segment of The World". AsiaTravelTips.com. 2005-04-13. Retrieved 2006-12-29. ^ "The Island of Ireland". Retrieved 2007-07-23. ^ Delgado, Martin (2009-01-17). "Homesick Balham boy buys Britain-shaped island for £43m". Daily Mail. Retrieved 2009-04-08. ^ "World's Finland and Brunei to be hub of fashion". Emirates Business 24/7. 2008-04-24. Retrieved 2008-04-27. ^ Syal, Rajeev (2010-07-23). "Owner of Dubai's 'little Britain' jailed for non-payment of cheques". The Guardian. London. ^ McGinley, Shane (2012-07-23). "EXCLUSIVE: Two Safi Qurashi judgements quashed". Arabian Business. Dubai. ^ Hyslop, Leah (2012-07-24). "Briton Safi Qurashi has convictions overturned in Dubai". The Telegraph. London. ^ Valdini, Claire (2013-02-13). "Dubai's Safi Qurashi cleared of bouncing $2.7m cheque". Arabian Business. Dubai. ^ Fernandez, Ashford (2013-12-04). "Safi Qurashi's former partner ordered to repay $10.8m by Dubai court". Arabian Business. Dubai. ^ Raven, Hannah (2015-01-17). "Interview: Not the End of the World, Safi Qurashi". Construction Week. Dubai. ^ "The Heart of Europe". Retrieved 14 February 2016. ^ "Heart of Europe in Dubai: Streets with snow". Emirates 24/7. 20 January 2014. Retrieved 14 February 2016. ^ "VIDEO: Plans to make it snow in Dubai are not a gimmick, says CEO". 7Days. Retrieved 14 February 2016. ^ a b c d e f g h i j k l Dubai FAQs. "The World Dubai". Dubaifaqs.com. Retrieved 2012-07-07. ^ smh (2006-03-30). "Sir Richard Branson 'Stakes his Claim' on The World in Dubai". Asiatraveltips.com. Retrieved 2012-07-07. ^ Jacobs, Frank (2014-10-30). "The World (Under Construction)". BigThink. The Big Think, Inc. Retrieved 22 December 2015. ^ "Cinnovation acquires Nova Island on The World (UAE/SG)". Europe-re.com. 2010-06-01. Retrieved 2012-07-07. ^ "Dubai unveils 'Pearls of Arabia' at The World | DMCC". AMEinfo.com. 2012-06-20. Retrieved 2012-07-07. ^ a b c - Saturday (2012-06-06). "'The World' three-quarters sold out - The National". Thenational.ae. Retrieved 2012-07-07. ^ "First developer breaks ground on The World | Real Estate". AMEinfo.com. 2012-06-20. Retrieved 2012-07-07. ^ "The World LLC settles with Kleindienst Properties". Nakheel PJSC. 6 May 2013. Retrieved 14 March 2014. ^ System Administrator. "Dubai's The World: Construction on Taiwan begins post-Ramadan". Emirates 24-7. Retrieved 18 April 2016. ^ "Settlements worth AED807 million put The World back on the map". Nakheel PJSC. 2 July 2013. Retrieved 14 March 2014. ^ "Road could be built to man-made World development". Retrieved 18 April 2016. ^ "JK Properties Monthly Newsletter (January 2014), "KLEINDIENST GROUP LAUNCHES ICONIC THE HEART OF EUROPE PROJECT"". JK Properties. January 2014. Retrieved 14 March 2014. ^ "The Heart of Europe - Construction Updates". The Heart of Europe. January 2014. Retrieved 14 March 2014. ^ "JK Properties Newsletter (February 2014), "The Construction of the Heart of Europe Islands is Now Well Underway"". JK Properties. February 2014. Retrieved 14 March 2014. ^ Fahy, Michael (7 December 2016). "Heart of Europe development at The World Islands off Dubai coast takes major step forward | The National". The National.